TIMOTHY BRADLEY: Training camp is going great. Are you guys ready for this?! April 12 is going to be a great night for everyone involved on HBO Pay-Per-View. It’s the second time around. Tim Bradley versus Manny Pacquiao or Pacquiao versus Bradley – however way you guys have got it. I have had a sensational training camp so far and i am going to finish up pretty soon and the fight is on, man, I can’t wait. JOEL DIAZ: Nothing different (for this fight). The only difference is, you know, we are going to ruin the party because all the odds are against us. Tim Bradley has that in mind. But we don’t really feel that is import and, I’ll be honest with you, everyone is going to WIld Card to see how Manny Pacquiao has been training — great — and “he is in great shape and great preparation,” but nobody comes around to Tim Bradley’s gym to see how he is doing. But in a way I like that because curiosity sometimes puts a little fear. Because nobody knows how Tim Bradley is training. He is very ready to come to Vegas and ruin the party for a lot of people. But this it is going to be very decisive and there will be no doubt. This preparation is going to be not much different but now we have unfinished business. Bob, you have promoted your share of rematches – anything special about this one? BOB ARUM: Of course it is special, because the first fight ended in a decision for Timothy Bradley and a lot of people thought that the decision could have gone the other way and that could be debated endlessly so the rematch gives a definitive answer to who is the better fighter. Do you still feel you have something to prove even after your two big wins against Provodnikov and Marquez? TIMOTHY BRADLEY: Absolutely, I have a lot to prove in this fight, and number one is that the first fight was not a fluke. There were a lot of things that happened in the first fight that weren’t right. This time I will be 100% ready. I have gained a lot of experience from my last two fights on HBO and HBO Pay-Per-View — one in particular, the one against Marquez, who is a great champion and a great fighter, legendary. And the fight against Provodnikov, the Fight of the Year. So I am a different fighter now. A different beast – a different animal this time around and I am going to prove to the fans and everybody watching. I got the win but it felt like I lost because I didn’t get any credit from the fans and it’s important to get the credit from the fans. I feel I need to showcase myself and win by a large margin. When things happened in the first fight? What do you mean? TIMOTHY BRADLEY: I am talking about my feet. That’s all I am talking about. Even after your two big wins, do people come up to you and talk about the Pacquiao decision? TIMOTHY BRADLEY: Not at all – that has all died down now. They know the fight is coming quickly and they can’t wait for this fight. It is going to be sensational and it’s going to be one of the best fights this year. I am telling you man, both of us have a lot to prove in this fight, man. The reason why Pacquiao really needs to win this fight – because if he loses this fight, think about it – his career might be over. I really need to win this fight because of the controversy of the first fight. You know “I beat him, I beat him, I beat him,” but this time I need to beat him more decisively because of the fans so they can give me the credit for it. Is this going to be the Bradley we saw against Provodnikov where you just went to battle or are we going to see the Bradley who fought Marquez, who won a good fight but boxing? TIMOTHY BRADLEY: Everybody is going to have to tune in to see which Timothy Bradley is going to show up. I am not going to give away my game plan right now. Everyone knows what Manny Pacquiao is going to do. He is going to try to bring the fight to me and I am just going to show everyone it is not going to work. Do you feel the rematch is taking place at the right time and not immediately and being forced on the people? TIMOTHY BRADLEY: I think that everybody thinks I am a quality fighter right now and my status is completely different than it was in the first fight. I wasn’t really known in the first fight – everyone was like who is this guy? Now having won the 2013 Fight of the Year and beating Marquez, who knocked out Pacquiao in an unbelievable 2013 – I think the fight is even bigger right now than it was in the first fight. BOB ARUM: Because of the controversy in the first fight, if we had done an immediate rematch I think most of the time being spent by the media would have been on ‘was the first fight fixed?’ therefore getting a second fight and now you don’t hear any of that because obviously the fighters went on to do their thing against other opponents. Now we have a great fight and there is no adverse commentary as to any kind of manipulation in the first fight. Do you have to guard against being reckless knowing you feel a need to prove something? 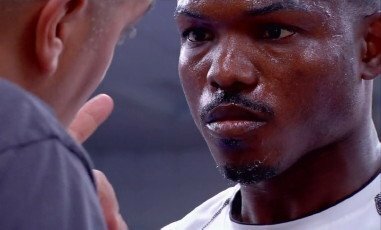 TIMOTHY BRADLEY: The one thing I have learned is to not be reckless and not get away from the game plan and listen to my corner, so that won’t happen in this one. That fact, of me fighting hard and with my determination and my will, and because I want to win this fight with no questions. We have a game plan and I am going to go out there and execute my game plan and that’s that. When I fight in the trenches or a war, or I go outbox Manny Pacquiao – I will win no matter what. Can you talk about making sure Tim stays on point? JOEL DIAZ: It took a couple of fights to learn that every fight is an experience. Looking at his previous fight he knows that when he goes on his own and does what he feels like he gets in trouble. When he follows the game plan and listens to the instructions in the corner he is always in good shape. So with that being said, after the Provodnikov fight, he learned there are ways you can approach your opponent but at some point you have to be smart. On that day it was more of a mad Tim Bradley – he had a lot of anger in him because of the way the media and the fans approached him (regarding the Pacquiao fight). That was an experience and I don’t think that will happen again. In this fight, regarding the controversy, I know that Tim has all of the weapons packed up and ready to go for the fight. I know if Tim needs to go inside and brawl he is going to do it. If he needs to outbox Pacquiao he is going to do it. We are ready for everything – we are leaving nothing behind. I am going to be watching very carefully in the corner and if he listens to my instructions, he will be fine. There are going to be times when he is going to be on the outside and times when he will be on the inside and that all depends on Manny and what he’s got and we make adjustments. If Manny’s going to bring it we are going to be ready. If he’s going to hold back and box, Tim’s going to be ready. There is nothing we are going to be surprised about – we are going to have everything ready. Do you think the knockout to Marquez affected him? JOEL DIAZ: Every fight will leave a mark on your career. When Marquez knocked him out that really left a mark on his career. We saw a lot of differences in Manny Pacquiao. Manny Pacquiao is a fighter that brings it. He comes to destroy the opponent. He had an opponent in front of him that he could hit, even with his eyes closed and couldn’t finish him. According to him, he was compassionate and he didn’t want to finish him and that was very surprising. I know if somebody comes and kicks me in the chest I know that Timothy is going to make the guy pay for it, you know? But he became very compassionate so we’ll see what he does on that night with Tim Bradley. TIMOTHY BRADLEY: I have seen it way before that. The first fight we had he said he was compassionate. He carried me through the fight and he never really trained that hard and made-up every excuse in the book. Pacquiao is going to be vicious. I think I pissed him off. I got under his skin by saying that he lost it. He’s been training hard and I heard throughout the grapevine he has been looking sharp – and that’s his job, he needs to be at his very best. And I have been working hard too, so we can put on a show for the fans and that’s what it’s all about. What did you learn about Manny in the first fight? TIMOTHY BRADLEY: I was able to make adjustments and I was able to move and Manny had problems with me when I was moving. He is expecting me to move around this fight and he is getting ready for it. He is going to be in tune for every movement I do. But they also say he is ready for the war too, so we have to wait and see. There has been a lot of talking man. I just can’t wait to get into the ring and showcase my talent and to put on a great show for all of the fans watching around the world on HBO Pay-Per-View. Can you talk about the Nevada testing – your first time doing it? TIMOTHY BRADLEY: Just to clear things up – Manny didn’t care what testing we were doing. He was willing to do VADA or WADA so there was no argument as far as the testing goes. I just chose to do the VADA testing to stick by what I have tried to set out to do and that’s to clean up the sport and making sure that a lot of these guys are getting tested. The NSAC decided they didn’t want to do VADA representing us, they wanted to do the same that we did in the Marquez fight – WADA which was very successful in that fight so they wanted to stick with it and not mess around with VADA. I am doing double testing just to prove to everybody that I am a clean fighter and am willing to do whatever with hard work and dedication, which is how I got to this position. Many boxing experts have been picking you to win this fight – why do you think that is? JOEL DIAZ: I really don’t know man. I just think from my experience I think that a lot of the writers and the boxing people that know, they see Manny Pacquiao at his age – everybody sees that Manny Pacquiao is at the end of his career. He has fought the best fighters out there. Now they see that he is diminished. And after the knockout in his last fight with Marquez they saw a downfall in him and after Bradley went to war with Provodnikov – a heavy hitter, by far the heaviest hitter he as ever fought and went into the fight and beat Ruslan and came back and beat Juan Manuel Marquez at his own craft. I think they are putting the numbers together. Bradley has gained a lot of confidence, he is in the prime of his game right now – so they see TIm Bradley winning. TIMOTHY BRADLEY: He said pretty much everything I thought. I think everybody has seen me grow in the last two years and they see how confident I am and my ability. I fought two different styles and I was able to come out victorious so a lot of people are definitely getting behind me right now and they feel that Pacquiao is declining and this is my time. Do you feel you are the most disrespected undefeated champion in the sport today? TIMOTHY BRADLEY: No, absolutely not. I don’t feel I am disrespected. I honestly feel that the boxing world knows who I am. The boxing fans know who I am and they respect me. I don’t feel disrespected at all to be honest. Do you feel you have gotten credit? TIMOTHY BRADLEY: Maybe before because it’s all about – show them my craft and just fighting – that’s what it’s all about. Fighting the best fighters out there and beating them. That’s it. I came up the hard way. I came up through the back door. Now I have had a Fight of the Year and two incredible wins. I think now fans are beginning to gravitate towards me and before they didn’t know me. And after the controversy, they really hated me like I had anything to do with it. I didn’t have anything to do with anything. I’m not a judge – I just went in there and did my job. At the end of the day all I’ve got to do is continue to win and they have no choice. TIMOTHY BRADLEY: There is nothing to be concerned about regarding my health right now. I am 110% right now. There is not a fighter that goes into the ring that is not 110%. I am mentally and physically dialed in for the fight on April 12. By mentioning that Manny has lost his fire – do you feel you are getting into his head? TIMOTHY BRADLEY: Well, when was the last time you saw him knock somebody out? It’s been a long time. Then he had a guy sitting in front of him, he was a tough guy — Brandon Rios — I have a lot of respect for — but he was right there in front of him and he couldn’t get rid of him. He is supposed to be one of the vicious punchers in the game. I have never seen Manny Pacquiao take a step back before – I think it was the last round of the Rios fight and he had RIos trapped in the corner and you saw Manny take his foot off the gas pedal and it was unbelievable to me. In our fight, I had two wounded feet and he couldn’t take me out. What makes you think he can take me out with two good feet? I had two wounded feet and that’s when I started noticing – he has the ability, man – now don’t get it twisted as me saying he doesn’t have the fire or the passion – Manny Pacquiao used to come in blazing and knock guys out, just knock them out and he didn’t mess around. Now it looks like he is more compassionate towards his opponents and that’s not good for boxing. How much does being undefeated mean to you? TIMOTHY BRADLEY: Being unbeaten is a great accomplishment, but it’s not everything in boxing, honestly. I feel that fighting the best fights and going the fans what they want is the best thing for you and your career. A lot of guys that are legendary have losses on their records but they fought the best fighters in the world and that’s what is important to me – I want to be one of the best fighters in the world. I want to fight the best out there because I want to be the No. 1 fighter in the world – and that’s what is important to me. Maintaining my health is great but every dog has his day. This next fight – I may lose this Manny Pacquiao fight, but you never know. Things happen in the ring when you least expect it. It only takes one punch to end the night and we know that. At the end of the day, my 0 doesn’t really mean that much to me. It’s just there. I have beaten everyone they have put in front of me, that’s all it means but I just want to fight the best. Since you say that, how badly do you want to fight Mayweather? TIMOTHY BRADLEY: It’s not how badly I want to fight Mayweather. Mayweather already knows I will fight him any day and any place. It’s how bad Mayweather wants to fight me. Whether or not I fight him my career is going to go on and my legacy is going to keep on building. Whether he is there or not, I am going to keep on winning against the best opponents out there. Are you worried your legacy will say you didn’t fight the No. 1 guy? TIMOTHY BRADLEY: At the end of the day, Mayweather is his own boss and if he wants to see me, he can come see me. I’ve got people that work for me and are building me – my wife who is also my manager, Todd duBoef, Top Rank, HBO and if Mayweather wants to come see me… He’s his own boss and he says that over and over and over. If he wants the fight to happen then so be it. I will never shy away from the best and Mayweather is the best right now. At the end of the day everyone is going to want to see the fight, but the business side of boxing is totally different and it’s not our fault, it’s just the way it is. Have you had any concussion symptoms lately? TIMOTHY BRADLEY: No, I didn’t feel anything at all. I have had help regarding that and I am 100%. You saw the Marquez fight – there was no problem. I felt like I was at my best that night. No problems, no symptoms, I’m good, 100%. TIMOTHY BRADLEY: That just says that I am one tough cookie. Even on my worst day I am hard to beat. So when I am 100%, it’s going to be harder to beat me. I am so mentally tough no one can break me. I have said it many times and said it to his face – if he does not knock me out he is not going to win. What was your best night? When everything went right against a quality opponent? TIMOTHY BRADLEY: The Marquez fight because Marquez is one of the best counter-punchers in the game and I outfought this guy and out-counter-punched him. And Marquez has been in there against all the best fighters in the world. Everybody – Mayweather included. Manny hasn’t been in there with Mayweather – Marquez has. That was a sensational boxing lesson I put on Marquez that night and it was one of the best moments I have had in my career. I had fun in there. I enjoyed how I was working and I enjoyed the fight and what I did in the ring. Do you feel you can win a clear-cut decision against Manny Pacquiao? JOEL DIAZ: Well, at the end of the night, if Timothy wins the fight clearly, and they give it to Manny, the world will know. Winning the fight decisively and giving the world what they want to see. If the fight is close and it goes the distance, of course, Manny Pacquiao is a favorite in every angle and of course we expect that. That’s why we are working extremely hard to not let that happen. We want to make this fight decisive and we want to beat Manny Pacquiao decisively. Walking out of that ring that night and if Tim Bradley beats Manny Pacquiao and the world sees that and we walk out of there with a defeat at least people can see exactly what happened. We take that into consideration; going into another close decision won’t be in our favor. They have big plans with Manny Pacquiao and boxing is not only a sport it is a business. But they are trying to count Tim Bradley out and they can’t. I am telling the whole world right now – TIm Bradley is going to come April 12 and he is going to ruin a lot of peoples’ party by beating Manny Pacquiao again. Do you feel the two fights you’ve had since Pacquiao have helped you? TIMOTHY BRADLEY: I thought that fight [against Provodnikov] was just pure heart. I was in a bad place mentally for that fight. That’s the reason why I fought the way I fought that night with the controversy I went through and that was my first fight back. I felt like I had a lot to prove to the fans and to myself and prove to the world that I am a true champion that belongs at the top of boxing and that’s the reason why I fought that way. I wanted to showcase what I was made of. I learned a lot from that fight going into the Marquez fight. They offered me the Manny fight but, after that crazy fight with Provodnikov, there was a light shining on my career and I wasn’t ready to visit that dark light just yet. Give the guy that just knocked him out. Everyone thought I was crazy. They said, ‘dude, are you insane?’ I talked to Todd and he said, ‘I’ll make it happen.’ He made it happen and I went back to the drawing board and basically working on my craft and listening to my corner and staying disciplined. It worked out well. I came in and beat Marquez and now I know what I am capable of doing. If I need to dig down deep I know I have it in there. If I need to outbox the guy I know I have it in there. There is nothing I cannot do in the ring. I have the whole package. The only thing I may lack is, and I have fought a lot of great fighters, is power. TIMOTHY BRADLEY: That’s what they thought. I am not damaged goods. I am still one of the top fighters in the game. I am not damaged goods whatsoever. It’s how you bounce back that makes you a champion. I went and got some help and now I am 110%. TIMOTHY BRADLEY: That was spontaneous because I believe at that time they had Marquez and No. 3 behind Andre Ward and Mayweather. I just beat him. And after that Ruslan Provodnikov picked up the belt and I beat that guy and I told everyone he would be world champion. So I told everyone without question I am No. 3 because I just beat the No. 3 fighter in the game. Do you feel disrespected being billed as the No. 2 guy on the card? TIMOTHY BRADLEY: Listen, boxing is not only a sport it is a business as well. All parties need to understand that. It could have been Bradley-Pacquiao, but my team and I, we worked together to put on the best possible show to make sure that everybody included – my team, Top Rank, HBO – is happy with the results at the end of the day.. They came to me to ask me and I said I don’t have problem with it. I know Pacquiao is a big name and everybody knows it so Pacquiao-Bradley is OK. And I just basically negotiated everything else that I wanted to be treated like a champion. I want to walk out second. I want to be announced second. I want to pick my corner. It is all part of negotiations, that’s what it’s about and I have no problem with it. I know Sergio Martinez has a problem with it but Cotto is the name. Just like Floyd Mayweather-Canelo – Canelo was the champion but who is the bigger name? How has your sparring gotten better over the years since Joel Diaz has gotten more notoriety? TIMOTHY BRADLEY: The more guys the better. The more the merrier. It’s not only great for me but everybody in the gym is working together to accomplish the same thing – becoming a world champion. We all feed off each other which is fantastic. Sparring is always fantastic and we always have 3 or 4 guys that come down and work and help and guys that come from out of town that help us work as well. We get ready for every aspect of the ring and that’s how we do it. It’s fantastic that he has all these young fighters – even the ones he is starting off fresh that just came from the Olympics. He’s going to groom them into champions and it is fantastic to see. BOB ARUM: That was a great conference call today. I am very excited about the fight – it is going to be a very competitive fight. People are going to get their money’s worth and I think they are also going to be excited to watch this undercard action – we have some really top guys in two title fights. It’s going to be a great night of boxing and I hope to see everyone fight week in Las Vegas leading up to April 12. JOE DIAZ: We are finishing our preparations and TIm Bradley is ready to go. If the fight was this week he’d be ready to go. He is on weight and he is determined and he has a big smile on his face and we are just waiting for April 12. I hope everyone comes to our workout at Fortune Gym in Los Angeles because no one comes to our gym to see him train, so you can see him over there. TIMOTHY BRADLEY: I am just excited for this opportunity and I’m very glad that we all came to terms for this. Thanks for everything, Bob. I want to thank HBO Pay-Per-View and I want to thank you guys. I want to thank the MGM Grand for bringing us back. I’m happy to be here and I’m very excited for this event and I am inviting everyone to come out to watch the fight on April 12. It is going to be one fantastic night. This fight is going to be fantastic and I want all the fans to come out and be a part of it. 24/7 Pacquiao/Bradley 2 premieres Tomorrow, Saturday, March 29 at Midnight ET/PT — on HBO. Show 2 debuts Saturday, April 5 at 11:30 p.m. ET/PT and show 3 debuts Thursday, April 10 at 8:30 p.m. ET/PT two nights before the high stakes welterweight title bout. Previous boxing news: WSB: Playoffs Time… The real business starts now!